How much can I expect to get when selling my car? What if my car is special, like really special, imported, drive on the wrong side shift with my left hand kind of special. A Nissan Skyline GTR - How Hard is it to sell a unique car like that? Everybody knows a car is not an investment, but what if it's truly unique and in a super niche market, and there were relatively few made even fewer imported here. That makes it rare, but that also makes it harder to find a serious buyer. Having bought and sold two of these myself, both GTRs, in red - which by the way is one of the more rare colors - I can tell you, selling anything comes down to the marketing, the red GTR pictured above was my second buy and sell. The one below being the first. The car so nice I bought it twice! The key to selling your car, and if you're lucky, for more than you paid for it, is to make sure you improve the car and keep it looking well kept. Do the maintenance, clean things up, wax and wash appropriately, keep it fresh looking. When it's time to sell you need to know your customer. If you post on craigslist, you're gonna get Craigs people, if you post on a super niche forum dedicated to the exact model of car you're hoping to sell, you might get a few more worthwhile inquiries, or a lot more fanboys, point being, it takes work, communication and a smooth transaction process to sell a car to a happy buyer. The best sales transactions are when both the buyer and the seller feel like they got a fair deal and each is satisfied with terms and conditions of the sale. 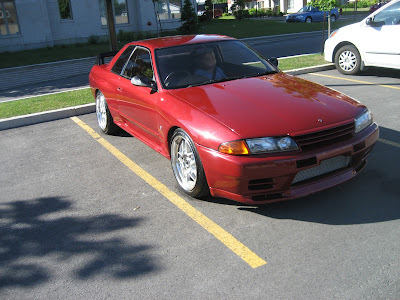 As I detailed in the conclusion to my own experience with my Second Skyline GTR Build Story some sales transactions can actually be a lot of fun for everyone. On both occasions in my experiences, the first person who came to see my cars in person, came cheque in hand, and left with the car - there was never a second viewing. Others how-ever have found that selling a car like this can become quite a night-mare, from tire kickers to scam artists' it can be very difficult. 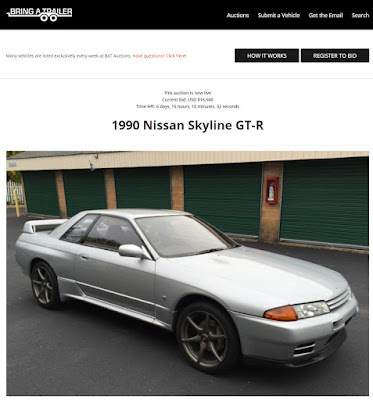 This is something jalopnik writer Doug Demuro blogged about in a recent post titled: Here's why it's so hard to sell a Nissan Skyline GT-R, which is currently posted for sale on Bring a Trailer (pictured above). Doug has documented his experiences with GTR ownership a bit in the past and just posted this very funny video of the exact craigslist experience. Hilarious video, and GLWS, just one thing quick though on a related topic, in a recent post comparing the BMW E30 to the Skyline GTR, Doug made the argument that these two cars are a lot more similar than they appear, due in large part to their "birth" out of 1980's boredom. While that may be true of your E30, it's definitely not true of the Skyline GTR. You see, the first car to be called a Skyline was made by Prince Motor Company in Japan, the Skyline ALSID-1 was introduced in April 1957, Prince merged with Nissan in 1966. The Skyline went through several generations, the S50, S54 and S57 in the 1960's, the first Skyline GTR came out in 1969 as the legendary Hakosuka GTR, which sported that famous 2.0 L inline six engine, that's 20 years before the first R32 GTR rolled out. Not to mention the years this car spent dominating the racetrack, quite literally nobody else could compete against it. Its easy. Just don't be an idiot writer that knows nothing about cars, and you are good.